Don't have a Credit Card or Paypal Account? Use this form. 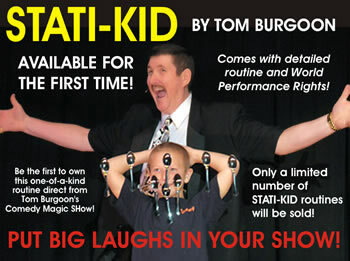 After years in the making Tom Burgoon’s LAUGH FILLED signature routine is finally released to you in complete detail! COMES COMPLETE WITH: Worldwide performance rights! 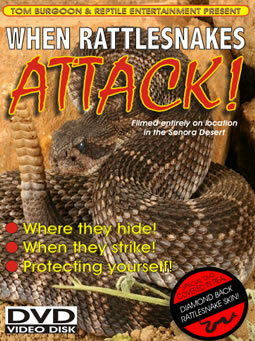 / Inside info never before in print! / DVD containing detailed performances! / Numbered certificate of authenticity suitable for framing! Complete and detailed manuscript! / Coupon for “FREE” mouth coils! / Tom’s special bonus material! / Autographed 8 x 10 of Tom and Timmy! 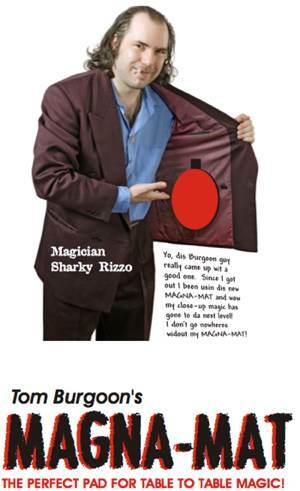 Tom Burgoon’s Timmy Toilet Paper Routine is packed with laughs and will fit easily into any show. Only a limited number of authorized notebooks will be released. 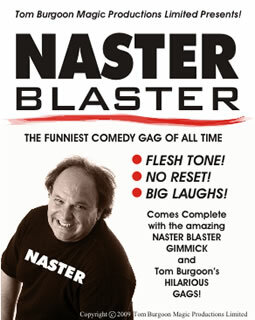 Don’t miss this opportunity to own this one-of-a-kind comedy routine! "This is a great routine! 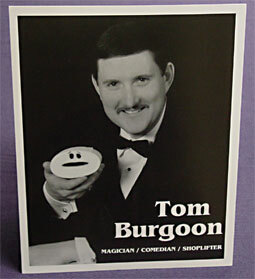 It will make you funnier that Tom Burgoon!" "Jay Marshall’s "Lefty" and Carl Ballantine’s “Worlds Greatest Magishen” are true classics of comedy magic. 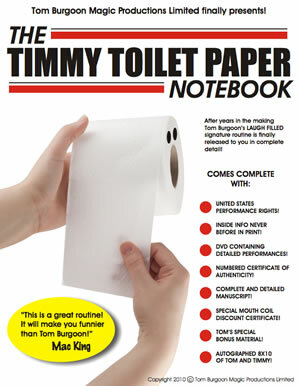 So is Tom Burgoon’s Timmy Toilet Paper! My advice, buy it!" "Tom, I can’t believe you’re giving this up! 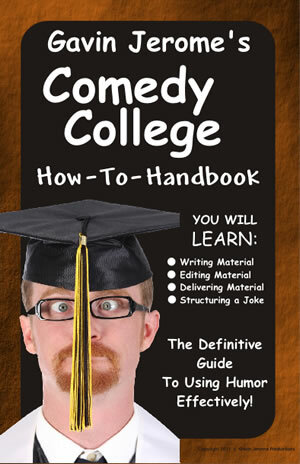 This is a hysterical piece of material!" "What a fabulous comedic routine! It packs small, plays big and is near perfect in it’s construction!" "If you are NOT funny, Timmy can get you the laughs you want! Tom’s Timmy Toilet Paper Routine is a very funny audience tested routine with hilarious sight gags!" 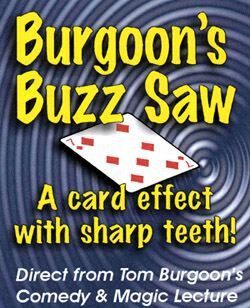 This hilarious effect from Tom Burgoon's Comedy Magic Show is the perfect prelude to any kid effect! You attempt to teach a kid how to do the old spoon on the nose trick. When he fails to accomplish the effect you explain he needs more static charge in his body. You then rub the kid down with an inflated balloon turning him into a super charged static magnet! Check out the video! HERE'S WHAT YOU GET: Tom's detailed routine / Spoons and secret stuff / Royalty free STATI-KID music along with world performance rights! BIG LAUGHS EVERY TIME! COMES ALIVE IN YOUR HAND! 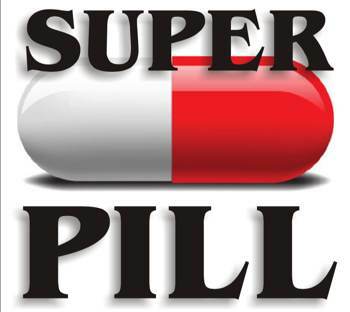 Use Tom's Super Pill for card tricks, mind reading effects and even lie detector tests! Self contained, always ready and easy to do! Comes with bits, Super Pill and comedy pill bottle label. YOU MUST SUPPLY YOUR OWN PILL BOTTLE! 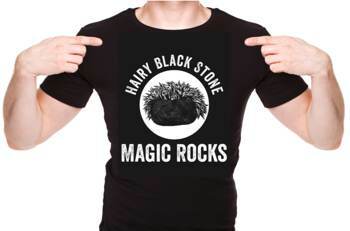 The latest magic T-shirt from Tom Burgoon Studios! Designed by Tom this shirt caused Gay Blackstone to laugh out loud! Fantastic for the beginner! 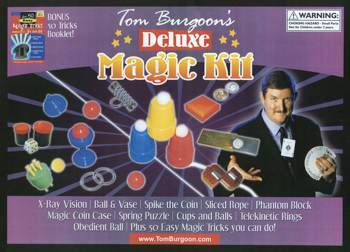 Tom's Deluxe Magic kit will have you performing over 50 amazing effects in no time! Cups and Balls, Mind Reading and even the Cut and Restored Rope are fun and easy to learn! Get yours today! A beautiful miniature 3" x 5" portrait of the Mona Lisa sealed in plexiglass is carefully removed from a velvet pouch and shown on both sides. One side containing the Mona Lisa and the other a portrait of her back! A card is selected and returned to the deck. Suddenly the chosen card appears in Mona's hand sealed inside the plastic! Of all the close-up effects I do, this one gets the most startled reactions from my spectators. Easy to perform and comes with the Mona Lisa sealed in plexiglass and velvet bag. These beautiful close-up mats are 7" round and come in crush velvet red, crush velvet green or charcoal black and are created by master mat designer Pat Przysiecki. Each mat has been constructed with a neodymium magnet hidden within the layers. With the included magnet attached inside the coat, it's the perfect place to keep your close-up surface out of the way until you're ready to perform. No more approaching at table with you mat in your hand. Magna-Mat stays in place and is ready to go when you are! 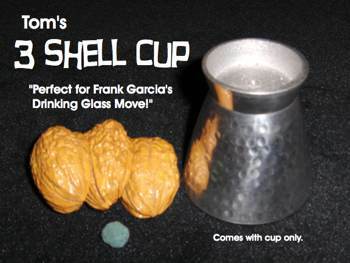 I love the three shell game and I've used this cup in my routine for over a decade. It has a rugged hammered chrome look standing 3" tall with a mouth opening of an equal 3". 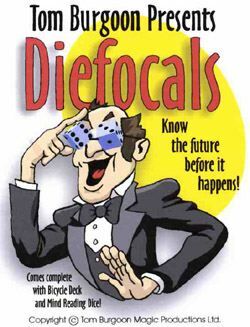 It is perfect for the drinking glass move as explained in Frank Garcia's, "Tells it all in a Nutshell." The base of the cup also has a 1/2" recess making it easy to load a pea underneath when the cup is in an upright position. I only have a limited supply of these left. Don't miss out. Comes with cup only. 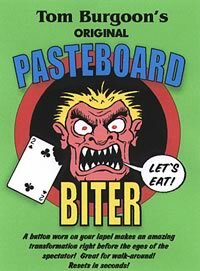 The Amazing Two Card Trick, also known as the Two Card Monte, is the perfect trick for the beginner or seasoned amateur. Two cards mysteriously trade places numerous times right under the spectators nose! Small enough to carry in your wallet or purse and is always ready at a moments notice. 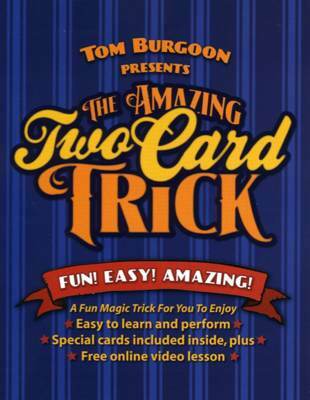 Comes complete with special cards, instructions and even an on line video lesson with Tom Burgoon! 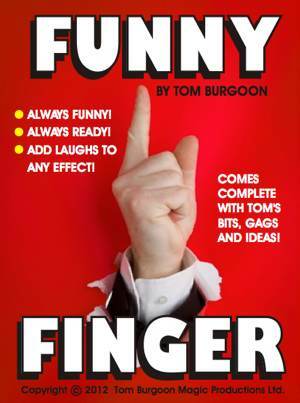 Give your audience the Funny Finger! Add this always ready comedy bit to any close up or walk around effect, or use it alone. Just the site of Funny Finger will get laughs from your spectator! 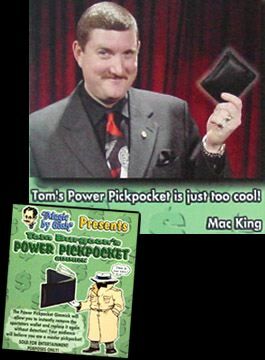 Comes with Tom's bits and ideas. Great for adults and kids too! Shoe Horn is fun! Shoe Horn is easy! Shoe Horn always gets a laugh. 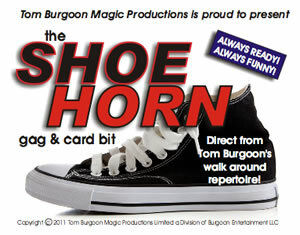 A great comedy gag and a fun card trick from Tom Burgoon's walk around repertoire! Comes complete with the Shoe Horn prop and Tom's comedy routine. 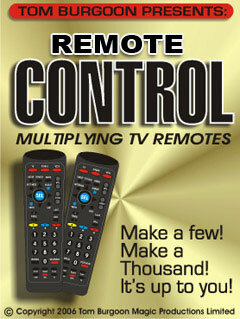 TV Remotes magically multiply at your finger tips! 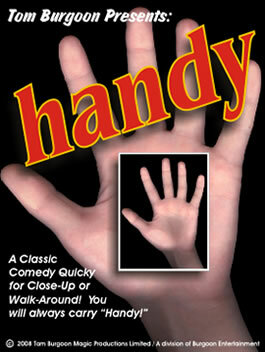 A fun and visual comedy bit for any stand-up act! A card is selected and returned to the deck. 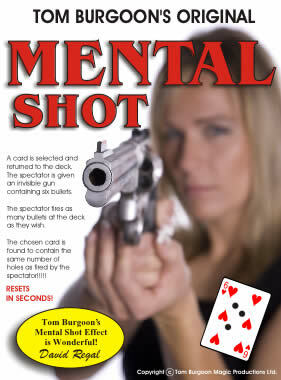 The deck is cut and the spectator is handed an Invisible gun containing up to 6 bullets. The spectator fires 1 to 6 shots at the deck. When the deck is spread, only one card has bullet holes. It is the Selected card and it has the right number of holes in it! An incredible effect. 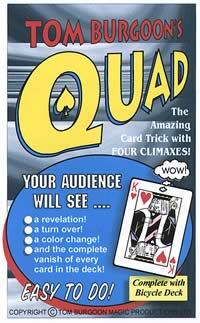 The Amazing Card Effects with 4 Climaxes! T.A. Hamilton & Tom Burgoon collaborated and came up with this gem. A card is selected and returned to the deck. Upon opening the card box, the spectator finds the name of the chosen card written on the inside flap! The deck is then spread upon the table revealing the chosen card is now the only one turned over! This card is removed from the deck and slowly turned over showing it now has a different color back than the rest of the cards! Suddenly the remaining cards are turned over showing the chosen card is the only card left in the deck! Every card in the deck now has a back on both sides and is completely examinable! Chewed gum has never been so fun! 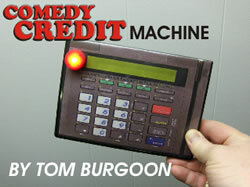 Tom's Comedy Credit routine is the perfect "call back" for any routine where you borrow and destroy the spectator's property. Borrow a credit card from the same spectator and make a nice transaction with your portable credit card machine. A pink ball instantly changes to blue! You can even hand it out for examination. Tom's color ball has a great comedy finish! A great utility gimmick for vanishing pens, lighters, bills, crayons, etc. Great for switches too! Never perform close-up work or walk-around without one! A card is selected and returned to the deck. 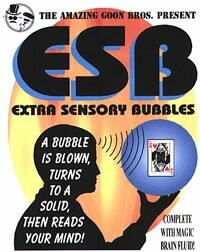 A small bottle of Psychic Brain Fluid is introduced and a bubble is blown from the solution. 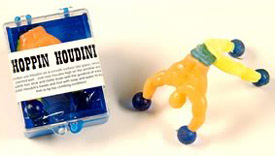 The magician grabs the bubble in Mid Air where it suddenly becomes solid. The second shocking surprise comes when the now solid bubble is seen to contain a miniature of the chosen card! Imagine turning an open bottle of liquid or even an open bottle of beer Completely Up Side Down and having the liquid remain suspended inside! 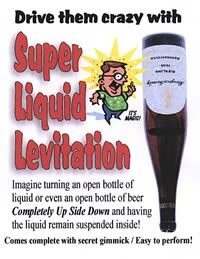 I've performed "Super Liquid Levitation" in my comedy magic show for over fifteen years and it has never failed to get a great response from the audience. Before the effect you can drink normally from the bottle. 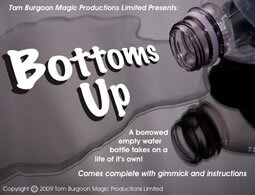 You then place your finger over the mouth of the bottle and turn it up side down. Suddenly you remove your finger and the liquid remains suspended inside! You can then poke tooth picks or bar straws into the mouth of the inverted bottle and let them float up inside proving there are no obstructions! The fun begins after borrowing two ordinary credit cards and placing them together back to back. 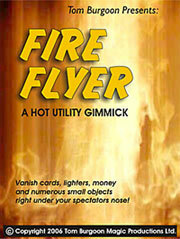 Now watch the cards begin to heat up as they fall in love and have a family right in the spectators hands! If you're tired of the old sponge bunny gag this is the effect you've been looking for! 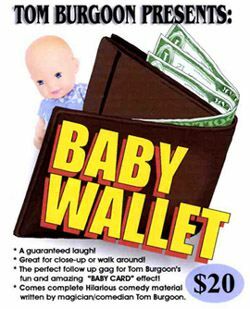 Fits in your wallet and is always ready to go! Easy to do and always gets a great reaction! 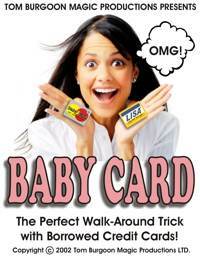 The perfect follow up to Tom's "Baby Card" effect. A real leather wallet reduced down to miniature size! Comes with Mini dollar and family pictures. You also get Tom's gags and routines. A guaranteed laugh! Spinning Buttons That Magically Morph! Display a button containing the picture of an 8 Ball. The button is placed on the table and given a spin. As the 8 Ball rotates the magician removes a deck of cards from his pocket and has one selected. When the 8 Ball stops spinning the "*" on the 8 Ball has changed to the chosen card! The button can now be completely examined. 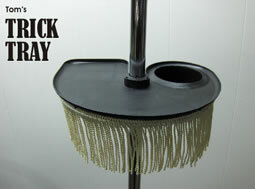 A great packet effect with a mind bending finish perfect for table hoppers and restaurant workers. Watch the spoons do their stuff! Four cards are shown each containing the picture of a spoon. A real spoon from the table is used as a magic wand and then things starts to get strange. 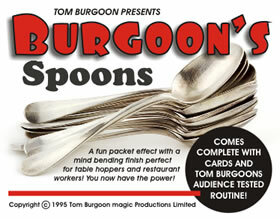 Using the power of your mind and the makeshift wand, you cause the pictures of the spoons to bend on command! For the kicker, all of the spoons on the cards magically straighten and your makeshift wand ends up bent on the table! 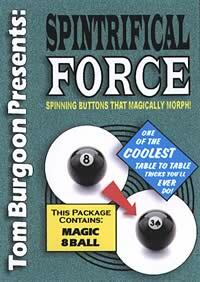 Great audience reaction along with an easy reset will make "Burgooon's Spoons" one of your favorite table to table miracles! One of the most amazing card prediction effects ever. Your audience does all the work and you get the applause! A complete sellout at both the IBM and SAM conventions! Comes complete with Bicycle Deck and Mind Reading Dice. 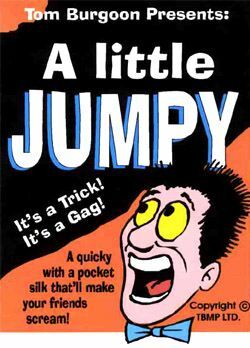 A small silk handkerchief jumps into the air to scare the "you know what" out of your victim. Absolutely no wires, threads or similar attachments. A card effect with sharp teeth! One of Tom's best close-up effects can now be yours! A card effect with one of the most unexpected revelations your audience will ever see! An ordinary pair of dice used to create this shocking, hilarious effect. A sell-out at the Cape Cod Conclave and Fechters Finger Flicking Frolic. These dice can bite you! 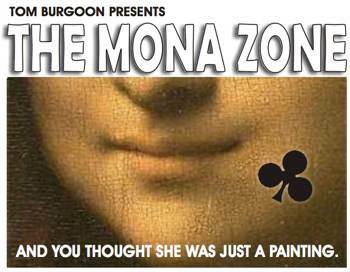 Direct from Tom Burgoon's magic lecture, Doc Eason calls this one of the funniest bits he's ever seen! Comes complete with routine, performance rights and pop bottle glasses. This tiny hand gag has been around for a long time and still gets a great reaction. A great looking miniature hand that also comes with three tiny cards so that the hand can reveal the selected card! Direct from Tom's Comedy Magic Lecture! Comes complete with great gags, bits and routines. 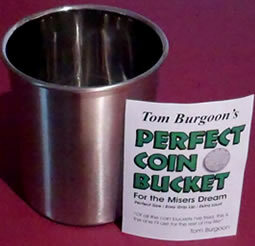 The best coin bucket for misers dream you will ever use. The sound when a coin hits the bottom of the bucket is incredible! The perfect weight / smooth top lip / the right size / what more do you want! Make a coin disappear and pull it from behind a kids' ear. But wai! 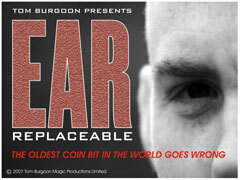 It's not the coin, it's the kids' ear! A funny comedy bit to use in any kid routine you do. The oversized rubber ear supplied can be seen easily from the stage. Cool! If you've seen Tom's comedy magic show you know how funny the warbler can be. These are the good warblers not made any more and from Tom's private stock. Draw a picture or write a prediction on a piece of paper. Your audience will go nuts when they see the picture morph and change into a completely different object! When you see it, you won't believe it! Great bits and ideas direct from Tom's Comedy Magic Lecture. These notes include the basics from Tom's amazing "Ultra Mint Coins!" HEY COLLECTORS! 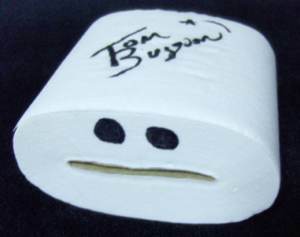 Own a Timmy Toilet Paper that was actually used in Tom Burgoon's show! Timmy comes signed by Tom and shrink wrapped to preserve him forever. He's ready to fill a special spot on your bookshelf! Like Crazy Eyes 2, these eyes can be seen through. The difference is they are slightly larger and made of a tacky rubber making them very easy to keep in. Even more hilarious than the original Crazy Eyes! 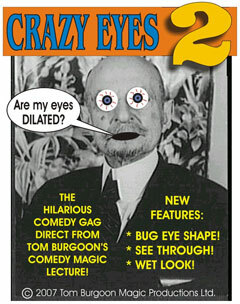 Crazy Eyes 2 has a new BUG EYE shape and you can see through them too! Get your autographed 8x10 of Tom Burgoon and the world famous TIMMY TOILET PAPER! Great for your magic room or bathroom! 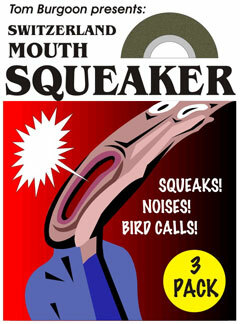 For use with any microphone stand with a 7/8" shaft. Great for when you need a quick table on stage. Even fits comfortably under your arm inside your jacket. Walk on stage, pop on your table and go to work. The drink holder can even be used to vanish small objects. 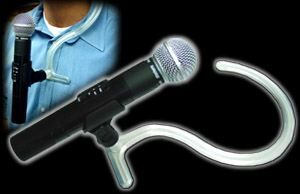 A true "hands free" mic holder – you attach any standard mic clip. Great for magicians, comedians and hypnotists. A must for any serious performer. Just attach your own microphone clip and your ready to go!